Before I get too far into into this post, I have to say thank you to my mother, for saving this document! It was mixed in with a bunch of my father's papers and could have very easily been thrown out by mistake. 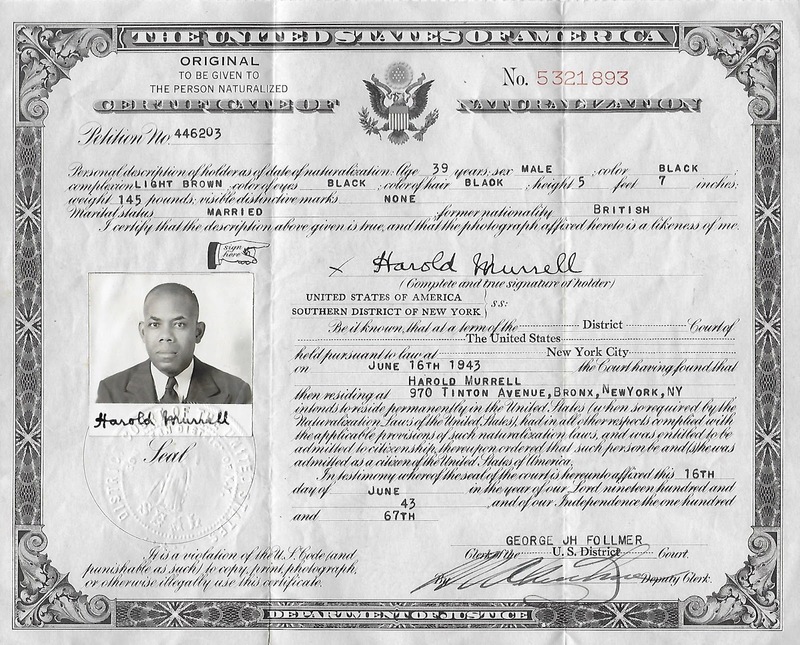 This is my grandfather Harold Murrell Sr.'s Naturalization Certificate. I am so proud of this man. He was born in Barbados and arrived in the U.S. on September 29th, 1927. When he arrived, he didn't have much more than the clothes on his back and from there he went on to create a full life. He married my grandmother Ethel Smith Murrell in 1932 and raised two children Janice and my father, Harold Jr., in the Bronx, and then later, Hollis, NY. He worked for mass transit in NYC for 30 years which made it possible for him to purchase his own home and take care of various extended family members. He was one of the good ones. intends to reside permanently in the United States when so required by the Naturalization Laws of the United States had in all other respects complied with the applicable provisions of such naturalization laws, and was entitled to be admitted to citizenship there upon ordered that such person be and (s)he was admitted as a citizen of the United States of America. Clerk of the U.S. District Court. or otherwise illegally use this certificate. Amanuensis Monday – this daily prompt, developed by John Newmark at Transylvanian Dutch, encourages bloggers to transcribe family letters, journals, audiotapes, and other historical artifacts. (An amanuensis is someone employed to write what another dictates or to copy what has been written by another.) You can learn more about different genealogy prompts over at Geneabloggerstribe.